Deception Island, off the Antarctic Peninsula. 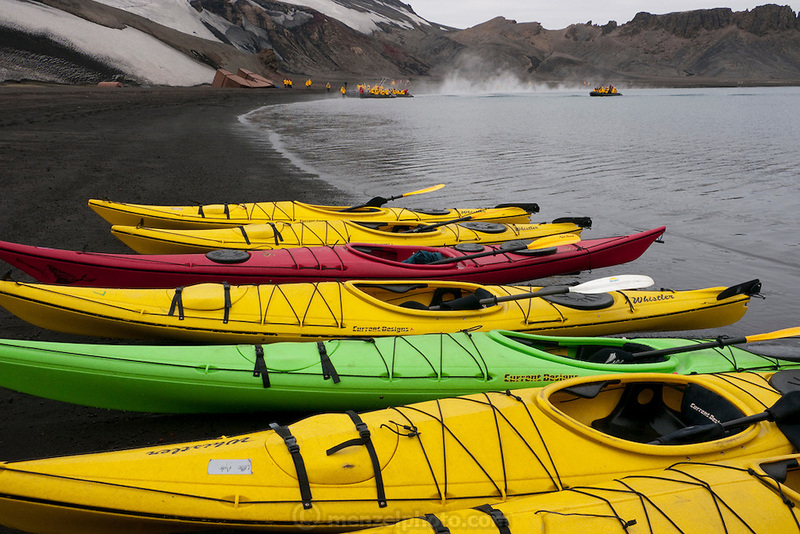 Kayaks launched near Pendulum Cove's thermal waters in Whaler's Bay, a protected harbor. Deception Island is the site of a circular flooded volcanic caldera. Conditions had to be perfect in order to kayak outside of the Bay, and they were. On the shore are rusting remains of Whaling operations (1911 to 1931) and the ruins of a WWII British base, Port Foster (1944-1967). Evacuated after a volcanic eruption, then closed permanently in 1969 after another eruption. Chinstrap penguins in the steam of the volcanics that are still warming the beach sand at Whaler's Bay.